Designer Marie Curtis puts an elegant spin on classic holiday décor. 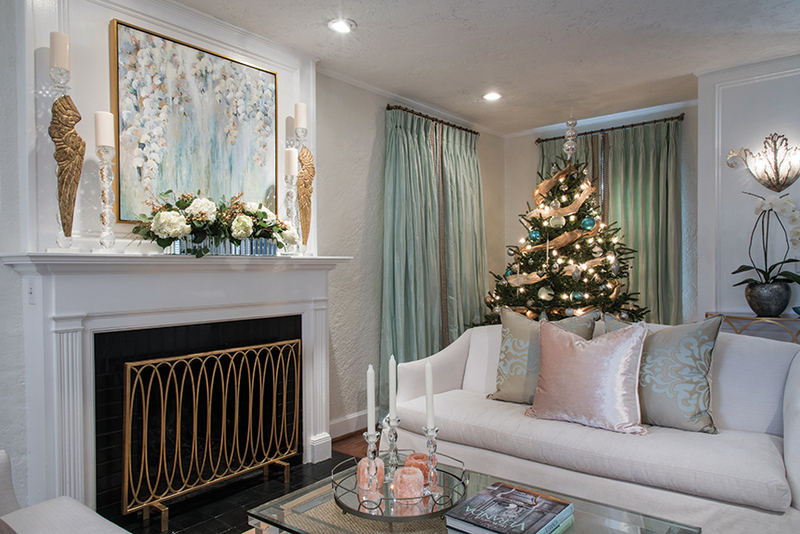 Gold vintage angel wings complement the custom Liz Nicholas painting that takes center stage on the mantel. 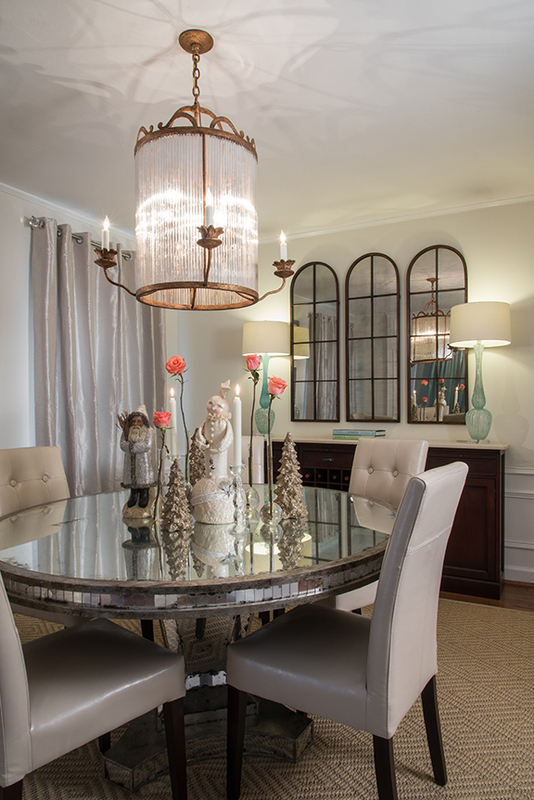 The dining room got a sprinkle of cheer with antique Bethany Lowe trees and a sweet snowman. An expert arrangements of winterberries, white hydrangeas and sprigs of greenery makes an appearance in the nook off the kitchen. A massive wreath accented with gold ribbon brings a bit of wintery glitz to the chic family hangout spot. When you walk into Nicole and Craig Jobe’s polished two-story home in University City, it’s hard to imagine that it was once a space with dark walls and no design direction. 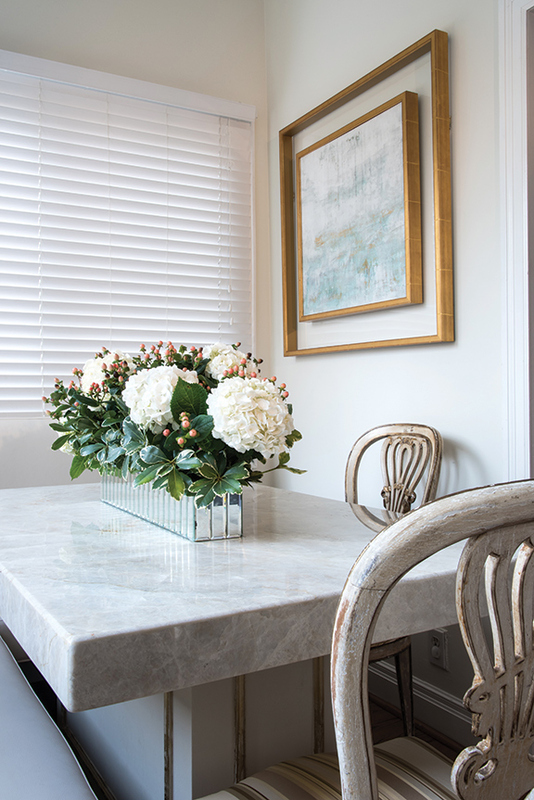 After the city-loving couple moved in a year and a half ago, they quickly turned to their friend, designer Marie Curtis of M. Curtis Collection, for style inspiration and a much-needed makeover. “We wanted our home to be chic, bright and clutter-free, and we knew Marie would be able to give us just that,” explains Nicole. Starting with a blank canvas, the duo decided on a dreamy palette of aqua, pale peach and gold. “The rich, celadon aqua is Nicole’s ‘happy color,’ so I let it take center stage and guide the rest of the design,” mentions Marie. With a minimalist mix of contemporary furnishings and antique accessories perfecting the look, the sophisticated sanctuary is a standout year-round, but is especially impressive during the holidays when the home’s glam factor is amplified. “Growing up, I always thought I would have an over-the-top red and green Christmas tree, but after one look at my home’s new style and one shopping trip with Marie,” laughs Nicole, “I fell in love with the idea of taking a more elegant approach to the season.” That voguish approach focuses on highlighting the muted colors, metallic accents and sparkly details that already adorn the space, as well as staying true to the simplistic style of the homeowners. “I have always told my clients to find festive pieces that complement their existing décor when decking the halls,” says Marie. 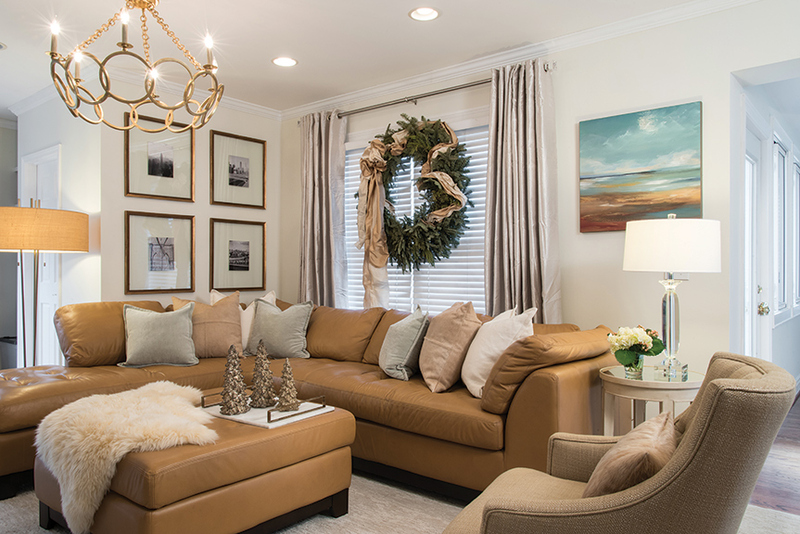 The family room is the perfect example of a merry pairing between the everyday and seasonal. Nestled behind one of the cream couches is the couple’s Christmas tree, which is outfitted with silver-and-blue glass ornaments, 6-inch Dupioni ribbon and a vintage Christopher Radko topper. “It’s not what I initially imagined having, but I love it so much that I would keep it up all year long if I could,” says Nicole. The sparkly showstopper is all dressed up in a similar color palette to tie in the aqua curtains that act as its backdrop. Niermann Weeks overhead lighting draws your eye to the fireplace, a must-have for the family during the cold winter months. Gold vintage angel wings sit on either side of a custom Liz Nichols painting to add an eclectic element to the generally modern motif of the room. “We didn’t want to clutter the space, so we chose to carefully add a few gorgeous seasonal touches that would still make just as great of an impact,” Marie notes. A massive wreath accented with gold ribbon hangs in the large window in the living room, bringing a bit of wintery glitz to the chic family hangout spot. A cream fur throw, Arlene Lilie marble tray and three gold antique Bethany Lowe trees sit on the ottoman to pull the cozy look together. The adjoining dining room got a sprinkle of cheer with antique Bethany Lowe trees and a sweet snowman, cream candle sticks and four dainty roses in a punchy peach. An expert arrangement of winterberries, white hydrangeas and sprigs of greenery makes an appearance in the nook off of the kitchen, and the same roses found in the dining room spruce up the master suite for the season.